Following complaints from a number of tourists about the number of vehicles making their way into the crater, the Ngorongoro Conservation Area Authority is thinking of ways to limit the number of vehicles entering the crater seeing as they seem to be a distraction to those enjoying the views of scenery and wildlife that the crater has to offer. 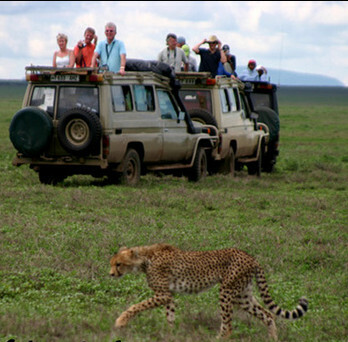 Much as it is a distraction, the growing number of vehicles is a sign of the destination’s popularity among tourists on safaris in Tanzania. The Ngorongoro crater attracts over 500,000 tourists every year bringing in revenues of about 55bn/- annually. Dr. Manongi the chief conservatoire said that the target revenue from tourism for 2014 is 60bn/=. He added that the reason why controlling vehicle traffic in the caldera is difficult is because game viewing can only be done from cars at the moment. The high season is about to start and the number of tourists visiting the Ngorongoro during this time is usually high. The number of vehicles is bound to increase and could easily reach 400 in a day. NCAA already has some limitations in place; vehicles that are not four-wheel-drives are not allowed to go down the crater. The walls of the crater are quite steep and challenging to climb. NCAA is currently working on implementing the concept of Hot air balloons after a few firms presented them with proposal to that effect as a way of reducing the number of vehicles in the crater. Serengeti national park which is adjacent to Ngorongoro is one national park that already has hot air balloons. There was also a proposal to introduce horse-back riding but the crater is full of carnivores such as leopards, lions, hyenas, cheetahs, and horned herbivores such rhinos and buffaloes and giant snakes which makes the environment very unfriendly and unconducive for horses. NCAA however is doing its best to promote Ngorongoro as a major Tanzania Safari destination. Other attractions such as the amazing Empakai crater, the Laetoli sites, and Oldupai Gorge which is very rich with history. Tourism in Tanzania has been very profitable and lucrative so far this year, not even the wildlife poaching issues can put a stop to the growth of the industry. Ngorongoro Conservation Area which is already a leading a tourist destination in Tanzania can only get better and more attractive to tourists with developments such Hot Air balloons, and more promotion.